So I'm pretty sure all the major parts of my life contradict each other. Take the fact that I'm a food blogger and a Crossfitter. Lots of Crossfitters follow the paleo diet — that is, no grains, legumes, dairy products, salt, refined sugar, and processed oils. So as you can probably tell, nope, I'm not paleo. At all. Are you kidding? I run a baking blog after all. What's worse, a dessert blog. I can only imagine the Crossfitters out there shaking their heads in dismay at me now. In any case, one of my friends, an avid Crossfitter who's been on the paleo diet for around a year and a half, asked me to make her a strawberry cake for her birthday. I believe my exact response was, "Strawberry cake? In winter? Off season? No way!" To which she responded, "I eat white sugar three days a year. Don't deny me this. Not on my birthday." Looks good, right? 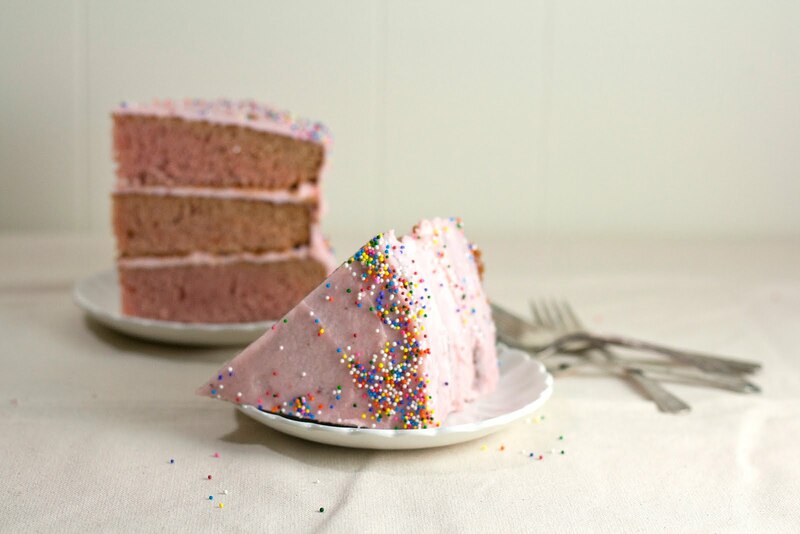 The recipe purees whole strawberries and incorporates it into both the cake and the buttercream to give us that lovely, pink tint you see. Even better, the recipe was unpretentious and instructed you to use frozen strawberries instead of fresh strawberries. 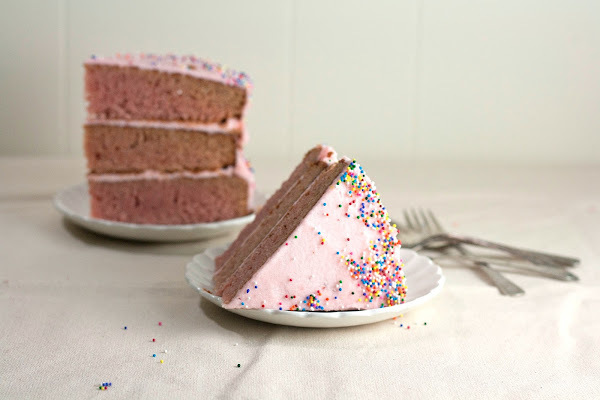 Perfect for a strawberry birthday cake in the winter time, right? And finally, according to the Brown Betty Cookbook, this recipe was named one of the five best cake recipes by Every Day with Rachel Ray. I don't know too much about that, but I can tell you that my friend loved it. "This is what I needed on my cheat day!" she exclaimed. Crossfitters. In case you were wondering, my friend allows herself to eat sugar on three "cheat days": her birthday, Thanksgiving, and Christmas. Yep. Three days. So be glad you're not paleo and can eat this cake anytime? Now go and make it! The frosting is to die for. Preheat the oven to 350 (F). Coat three 9-inch round cake pans with a nonstick cooking spray. Mash 16 ounces of thawed frozen strawberries through a strainer over a measuring cup until you get about 1 cup of juice. Reserve the mashed strawberries. Add the 1 cup of juice to a saucepan. Bring to a boil and cook until reduced to 1/4 cup. Using a food processor, pulse the reserved mashed strawberries until they are finely chopped. Add the 1/4-cup reduced strawberry juice and 1 1/2 teaspoons fresh lemon juice to the chopped strawberries and pulse until blended. Set aside. In a medium bowl, whisk together 4 cups cake flour, 1 3/4 teaspoons baking powder, and 3/4 teaspoon regular salt. Set aside. In the bowl of a stand mixer fitted with a paddle attachment, beat 2 cups of butter until light and fluffy, then reduce the speed and add 3 cups granulated sugar, beating until smooth. Add 6 eggs and 2 egg yolks, one at a time, beating until blended. Add 3/4 cup of the strawberry puree (from the third step), 1 1/2 teaspoons strawberry liqueur, and 1/4 teaspoon red food coloring and beat until just incorporated. Keeping the mixer speed on low, alternately add the flour mixture (from the fourth step), 1 cup at a time, alternating with 1/4 cup milk, 2 tablespoons at a time. Beat until smooth. Divide the batter equally among the prepared pans and bake until a wooden pick inserted into the middle comes out clean, around 30 to 35 minutes. Let the cakes cool in the pans for 10 minutes before turning them out onto a wire rack to cool completely. Mash 16 ounces of thawed frozen strawberries through a strainer over a measuring cup until you get 1 cup of juice. Reserve the mashed strawberries. Add the 1 cup of juice to a saucepan. Bring to a boil and cook until reduced to 1/4 cup. Using a food processor, pulse the reserved mashed strawberries until they are finely chopped. Add the reduced strawberry juice and 1 tablespoon lemon juice to the chopped strawberries and pulse until blended. Set aside. In the bowl of a stand mixer fitted with a paddle attachment, beat 8 ounces cream cheese and 2 teaspoons strawberry liqueur on medium speed until soft. Add 2 cups (4 sticks) unsalted butter and 1/8 teaspoon regular salt and beat until light and fluffy, using a rubber spatula to scrape the bowl as necessary, about 3 minutes. Reduce the mixer speed to low, add 1/4 cup of the strawberry puree (from the second step), and beat until just blended. With the mixer speed still on low, gradually beat in 2 1/2 cups confectioner's sugar, using a rubber spatula to scrape the bowl as necessary, until well blended. When all the sugar has been added, increase the mixer speed to high and beat until the buttercream is fluffy, about 1 minute. Use immediately. To assemble and frost the cake, place 1 cake layer, bottom-side up, on a cake plate. 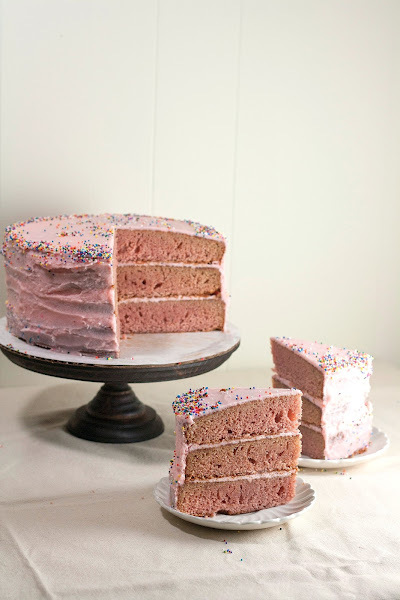 Use an offset spatula to spread 1 cup of buttercream on the top of the cake. 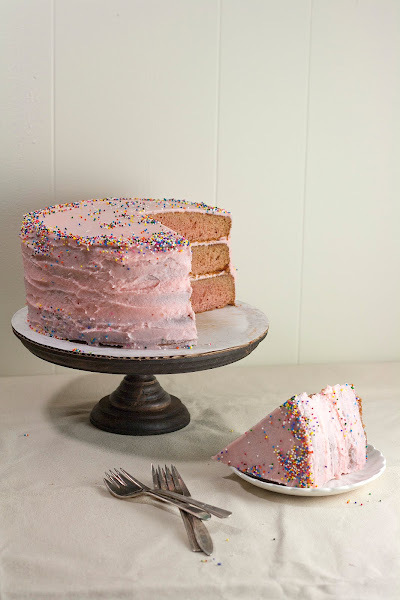 Add the second cake layer, bottom-side down, and spread 1 cup of buttercream on top. Top with the third cake layer, bottom side-up. 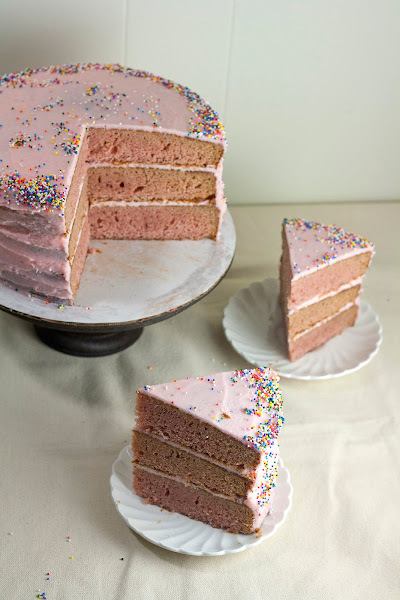 Frost the top and sides of the cake with the remaining buttercream. Oh, me too. Me too. But then I wouldn't be a blogger I guess? Looks lovely! I love your new header and blog design, too--they are new, right?? I eat a diet similar to the Paleo diet (but higher in healthy fats, lower in fructose and other sugars) and I can't imagine eating a regular cake, unfortunately... no idea how my body would react!! Hope your friend enjoyed hers a ton, though!! Yes, thank you for noticing! I updated my header at the start of the year. I'm awe of anybody who can eat Paleo (or similar diets). My dessert blog is definitely taking its toll on me. Is it necessary to use frozen strawberries and is the amount of liqueur cooked in safe for children?